Jade and Devin are our newest soon-to-be residents at Sarilia. 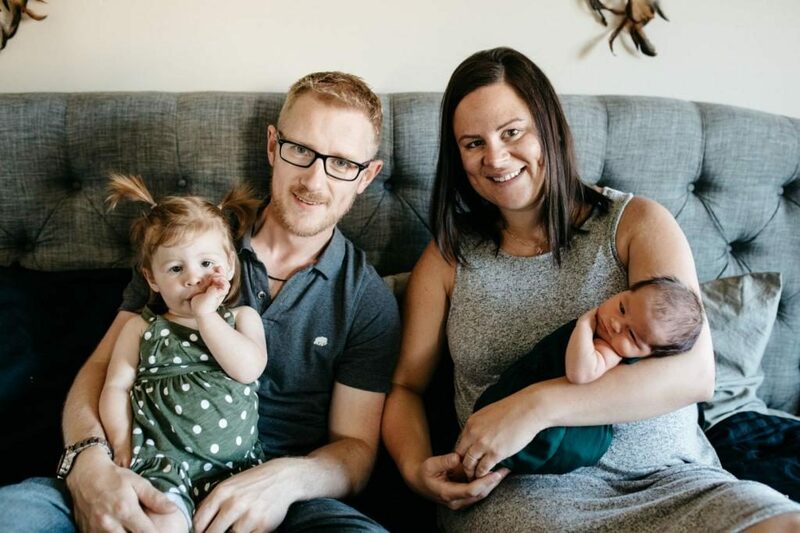 With two daughters (Sloan, age 2, and Neve, 5 months old) and a dog named Philly, they’re eager to start their new life in our river valley community this summer—they expect to move into their new A-frame-style home by July. We chatted with Jade to learn more about her family, what drew them to Sarilia, and how it felt to meet some of their future neighbours back in October. How did you first hear about Sarilia? We were looking at acreages online and we stumbled across one that was for sale at Sarilia. We drove out there and we realized how beautiful it all was, and how there was all this other property that we could look into. How would you describe your first impression? We felt like we were at the lake. It felt like we were at the cabin—instantly relaxed and laidback and just where we wanted to be. It felt like home. Where are you both from originally? And where are you moving from? I grew up in Martensville and Devin grew up in a little town called Frobisher, just outside Estevan. We live in Warman right now, so we will be moving from here. What was it you were looking for that you found at Sarilia? When I grew up in Martensville, it was a small town. And the community that Devin grew up in has about the same amount of people that Sarilia has. We both wanted that for our daughters. When we moved to Warman it was a bit smaller. Now, all the sudden, grocery stores are behind our house, Dairy Queen is right there, and the highway is right there—everything was just too close. It was too city-like. We needed to get away. Was there one feature at Sarilia that solidified your decision to move? It was a number of things. We didn’t know about the river access until we met with Gwen. We just thought we’d have a view of the river and we didn’t know everything Sarilia had to offer until we met Gwen. Our first impression would have been that we just want to be out there for the calmness and the view. Upon talking to Gwen a few days later, we realized the (little free) library, the river and the little nature reserves all around were just kind of bonuses. Is there something you’re most excited about in regards to your new home? It’s a little bit of everything. We’re really excited for the small-town community feel, and to feel like we can go and talk to our neighbours. Our girls can go down the street and ask a friend to hang out and we don’t have to be breathing down their necks or watching them all the time to make sure they’re safe. And the laidback lifestyle. Because you come home from a long day at work and it would just be really nice to go down to the river and have a wiener roast—just feel like you’re at the lake every day. Can you tell me about the style of your new home? We’re going with an A-frame. It’s going to feel like a cabin/cottage. We’re trying to go with that mentality—so a stone mantle above the fireplace and the A-frame overlooking the river. Why did you decide to hire Griffin Properties to build your home? I’m good friends with Sarah (Reid, the co-owner) so I’ve known them to be extremely hard workers. I’ve seen all the houses that they’ve built for themselves and all the time and energy they put into all the little details to make the house perfect for their family. I know when Sarah started looking at designs for our family, she was thinking about our family—not what everybody else would have wanted, but what our family needs and wants. Every little detail was thought of. They put a lot of TLC into the project. What do you and Devin like to do in your spare time? We like to travel a lot and we like to be outside and go to the lake. We have a cabin up at Chitek Lake with my parents, so we love to be up there all the time. I like to snowshoe, cross-country ski and snowboard, and Devin likes to snowmobile and downhill ski, so we’re very wintery people. We like to be outside more in the winter than probably in the summer. I run too—anything to be outside really. We’re always up for trying something new. Do you think you’ll get out on the water at Sarilia? Oh yeah. Devin wants to buy a canoe. He wants to do that and I like to (stand-up) paddleboard. We’d like to do more of that. My dad taught me how to fish, so I’d like to do that with the girls and teach them how to do things like that and appreciate nature. Do you plan to get involved in the community garden? Yes. I have two garden beds right now so I am definitely going to be doing that. Even now, I know they’re really young, but we have raspberry bushes and in the summer Sloan likes to go pick them and eat them. That’s kind of what I want to get my girls into—just being more with nature. It was really nice to meet everybody and we had a really warm welcoming. Everyone was so relaxed and laidback. I don’t know if that’s their personalities always or if being there brings it out of them, but I also felt like it was more of a family—like I could rely on some people to help out if need be and that kind of feeling. It made us more excited and we are very eager to be out there.